In our home we love photos and I am planning on getting some more frames and printing off more images for our home especially family ones. Pixa Prints recently got in touch and they have offered one of their 16x20" canvas prints to one lucky reader. All Pixa Prints canvas prints are hand stretched by their order finishing team, attention to detail is standard with Pixa Prints. Frames are made from pine wood stretcher bars, tensioned using canvas stretching bars to ensure a tight canvas stretch. We offer two types of frame thickness - 18mm or 36mm. 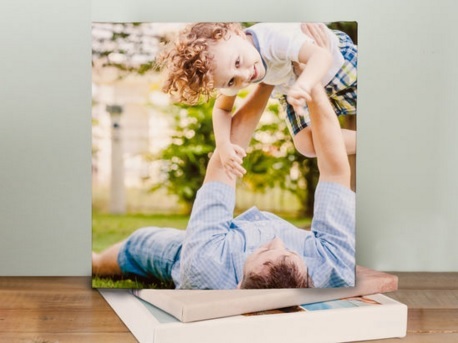 For your chance to win the canvas print complete the rafflecopter below. I would be using it to print a photo for my living room wall. I love having canvas pictures in the house, great giveaway! Id luv to give this to my mum would make a lovely gift. My hubby with a lovely pic of our kids and dogs. I would give this canvas to my husband for our 30th wedding anniversary. Ooh this is a lovely prize! Would love to give my husband it as a gift. We haven't got any of our wedding photos up in the house so this would be the perfect way to do it eventually! I would give it to my Mum. I'd be keeping it and putting it on the wall on my landing! I would give it to my partner! I have a really gorgeous photo of my son we took on his first summer holiday that I've been meaning to turn into something lovely like this. I will give it to my granddaughter for her birthday. I'd keep it to go up in our home. We don't have a canvas yet. I will be giving it to my daughter and it will hopefully have her new baby boy on it, he's due in a couple of weeks! My husband to use in his study. I would give the canvas to my daughter for her new home. I'd keep it for myself and put a family holiday photo on it and have it in my newly decorated living room! I think I may just keep this for myself!!! My lovely mum, her birthday is coming up!